In effort to support our green initiatives, ECM TRANSPORT is now offering customers the option of electronic billing. When completing the registration form below, please choose the format in which you would like to receive your billing: email, fax or EDI. Please note that by requesting electronic invoicing, you will no longer receive paper invoicing. *Note: All invoices include supporting documents, unless other arrangements have been made. Terms and Conditions: Any business conditions and terms stated in the master business agreement related to paper invoicing and payment also applies to electronic invoicing. 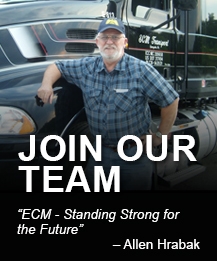 By submitting this form you are authorizing ECM TRANSPORT, LLC to change your delivery options.